A trick I learned a long time ago from a consummate correspondent: Buy a stack of cards, stamp them in advance, and keep them in a pretty box in a visible place with a pen right there next to them. If you’re trying to stay in touch with someone specific—your grandfather in the nursing home, your friend from college, your flame across the country—address the cards in advance and shuffle them up. Then, all it’ll take are two minutes and three sentences to remind someone that they’re important to you. Yes, email is so convenient and links to weird news always provide a laugh. And, yes, Facebook offers a million ways to poke your friends. But for this one week, pickup a pen and send your thoughts on paper. 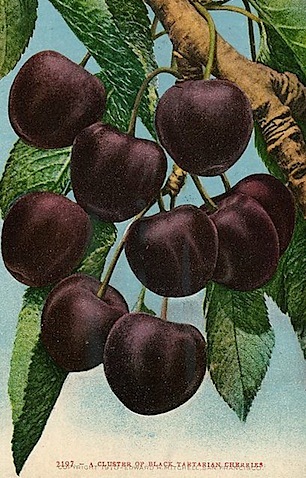 To help inspire you, I’m sharing a few food-related postcards from my own boxes. Some are waiting to be mailed out; others were sent to me from friends who know how much I like to cook and eat. 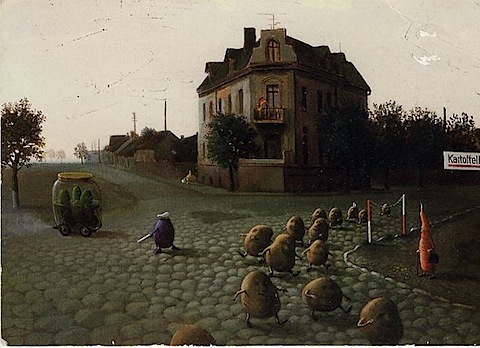 Below you’ll also find a few resources for tracking down interesting postcards, or, if you’re feeling especially ambitious and creative, making your own. 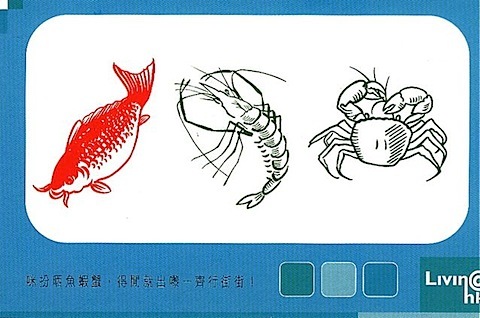 ¨A card from Hong Kong. One last quick note: On May 12, the postcard rate will go up to 27 cents. It’s still, a bargain, though, for injecting a smile into someone’s day, so go ahead and buy a couple books of the USPS’s brand-new, colorful tropical fruit stamps. 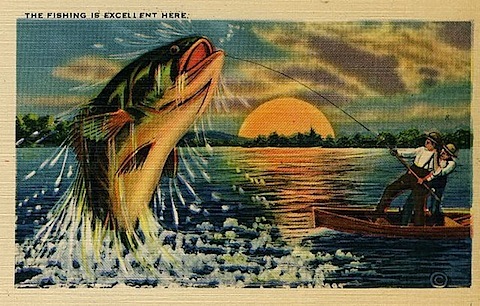 This linen postcard, showing of two boys and their very big catch, is from my own collection of vintage travel cards. 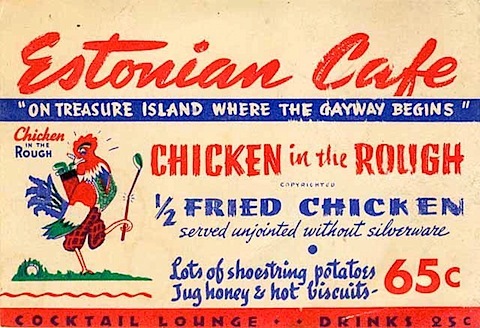 Local history buffs will want to browse these online exhibits of delightful historical postcards to learn about “Goats in San Francisco” or modern-day restaurant “freecards“. Visit SFBAPCC’s website to learn about their monthly meetings at Fort Mason or read their latest newsletter. The April aviation issue (PDF) includes a linen postcard showing the elegant tables in the Skyway Wing Room of San Francisco International Airport, with its expansive view of the ramps and runways during the cutting-edge “air age” of the 1950s and 60s. One of the foremost publishers of postcards and notecards is offering a postcard blowout sale. It’s a mystery assortment of 100 cards—plenty to get you through the week and beyond. 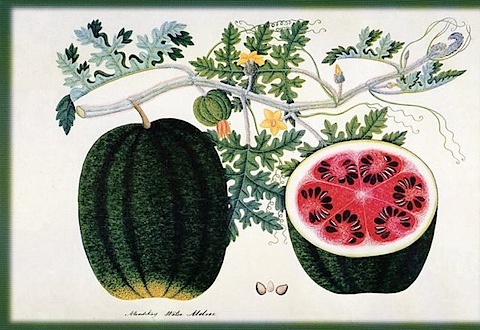 Visit the online museum store of the Museum of Modern Art to purchase a box of postcards featuring food art drawn from the paintings, drawings and prints in their collection. A card from Singapore, one in a series of drawings from the Straits Settlements of the early 18th century. This impressively extensive online art postcard gallery allows you to search by style of art, topic, artist’s country, or keyword. Select an image, type your message, and your friend will receive your virtual postcard. For the crafty among you, here are a few sites showing how to make your own gorgeous works of mail art. At the more involved end, see how leaves can be pressed into still-wet pulp to make elegant Japanese-style paper cards. On the much, much easier end, learn how to transform any photo into a unique postcard in seconds. A wonderful way to reuse AND amuse is by appropriating food packaging, such as dried pasta boxes, with their built-in, plastic-coated “viewing frame,” to make fun postcards. All you need are scissors, pen, and a postcard stamp. This last one would be an especially fun project with kids, but adults will enjoy these moments of creativity and connection, too. 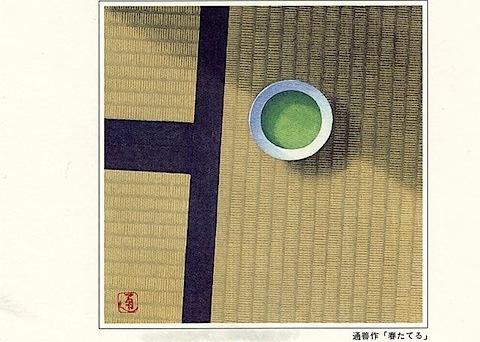 A cup of matcha on tatami mats. Japantown’s gift shops have beautiful cards. If you’d like to brush up on postcard history, spend some time reading about deltiology, considered the third most popular collectible hobby in the world after stamps and coins (baseball, limited to the US, counts lower). Since that first postage stamp in 1840, these little missives have helped document our shifts in technology, travel, communications, and social networks. No piece about food and mail would be complete without a mention of that classic tourist gift: a whole coconut mailed intact from Hawaii. Coco-notes and Fortune Coconuts are the modern incarnations of what surely the US postal service regrets ever allowing. 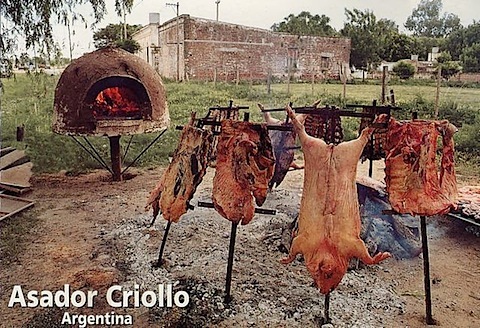 Cindy sent this from Argentina to let me know that she was eating fine.